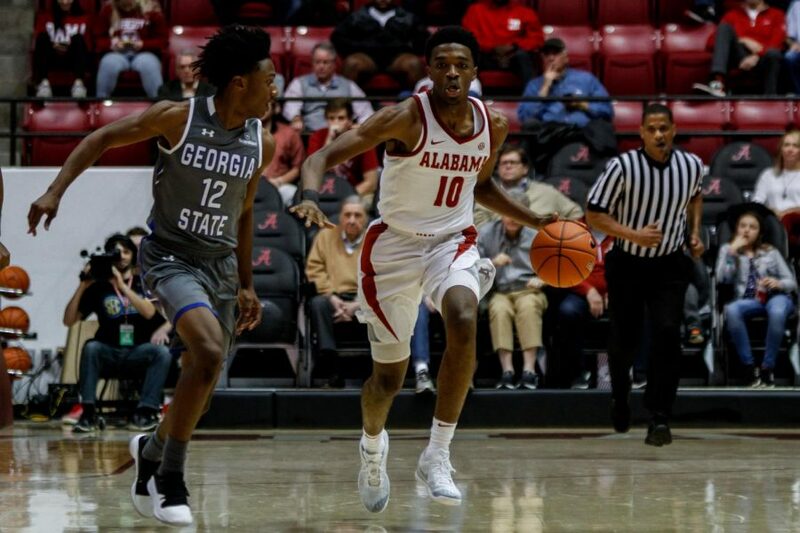 Alabama closed out the pre-conference portion of the schedule with its first true road win of the season by beating the SFA Lumberjacks by 10 at "the sawmill" in Nacogdoches, TX. We'll take a solid 9-3 record into SEC play. The first 5 minutes or so of the game were extremely ugly. We coughed up the basketball on every other possession between jacking up bricks, but somehow got to the first media timeout in a 2-2 tie. I thought we were settling for too many 3 point shots, getting into a 3 point shooting contest on their home court seemed like a recipe for disaster. We finally got Donta involved and they couldn't stop him down low, and that opened up the perimeter as Riley Norris started bombing 3s. After the slow start the game generally had a nice flow as we built a 7 point lead going into the half. We stretched the lead to 10-12 at several different points in the second half, but give some credit to the Lumberjacks for refusing to go away. We couldn't deliver the knockout punch and they kept going on runs to cut the lead to a couple of possessions. While I was annoyed at our inability to finish the game, I did like the way we responded each time they got within striking distance and the crowd got involved. Coach Avery did a good job of using his timeouts to stop the momentum, and I thought Donta showed good leadership in the huddle, keeping everyone positive while being a calming influence. 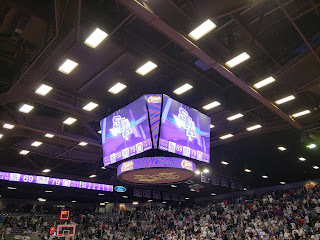 My only beef with Coach Johnson this game was leaving AJ in for too long, and going with a lineup of AJ, Dazon, Riley, JP, and Galin that allowed SFA to cut the lead to 4. 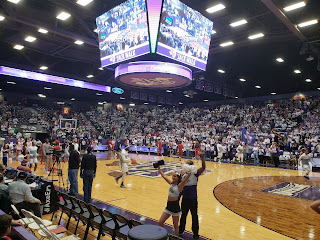 Kira and Donta came back into the game after a timeout and within 3 possessions our lead was back up to a comfortable 8 and the East Texas crowd was back in their seats. Riley Norris was the MVP in my opinion. He went 4 for 7 from three point range, and the last of those 3 pointers stretched a 2 point lead to 5 in the final minutes and silenced the crowd. It was also the third shot of that possession, thanks in part to one of his offensive rebounds. Riley's defense and 3-point shooting, along with our offensive rebounding down the stretch, were the keys to hanging on for the victory. In addition to Riley's 14 points we had 3 others in double figures, Kira had a quiet 17 to go along with 8 assists, Donta had a double-double with 12 points and 14 rebounds, and T-Mack had a nice game with 12 points. I really think Riley and Donta's experience and leadership were instrumental in keeping the team focused in a difficult environment. Herb struggled most of the game, he shot an airball and uncharacteristically bought on some average side fakes defensively, but he did make some key free throws down the stretch. We only made 14 of 20 from the line, but it was enough to hang on in the final minutes. The gym was terrible. I can think of at least three nicer high school arenas in the Birmingham area. The scoreboard/video screen was nice and large, but it stuck out like a 75 inch QLED 4K TV in a single wide trailer. It was dark, and you enter on the top row, the people at the top couldn't see all of the scoreboard due to the low ceiling. They had 2 concession stands in the whole building, and the lines wrapped half-way around the court. There were no separate stands selling only drinks, etc. One of my seats didn't even exist, I had seats 7 and 8 in a row that the seats only went to 7. I will be contacting their athletic department and seeking a refund for that ticket. Nacogdoches is a quaint, small, very rural town. If you like small, rural towns, you would probably enjoy a visit there, but personally I couldn't get back on the road fast enough. 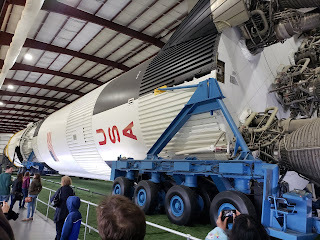 It was a little over a 2 hour drive from Houston, which was absolutely miserable driving through all the small towns in the rain. All of that being said, the people there were mostly nice, and in fairness I was operating on about 2 hours sleep after an early flight from Miami where I attended the football game the night before. My flight arrived in HOU at 9:15 am, and since I had a ton of time to kill I decided to visit the space center before making the drive north. I will post some pics below. It ended up being close to a sell out with a large walk-up crowd. I talked to a lot of people who weren't even huge SFA basketball fans but drove from hours away because it was such a big event for them. They seem to be more of a football school as they were excited about the new coach who was announced at halftime. He was complimentary of us for playing there, but said, "we're going to do so well that Nick Saban will bring his squad to Homer Bryce stadium in a few years." Our players were coming back out to warm up by that point and even they were cracking up at that comment. Their fans were enthusiastic and loud at times and it was a great atmosphere, even if they weren't the most knowledgeable. There was one young recruit there for us, but I'm not sure who he was. Kudos to the North Texas Alumni association for bringing about 30 fans over who were sitting across the aisle from me behind the Bama bench taking up a couple of rows. There was probably close to 100 Tide fans there scattered throughout the 7,000 seat venue, which I thought was actually pretty good considering the ridiculously horrible location. 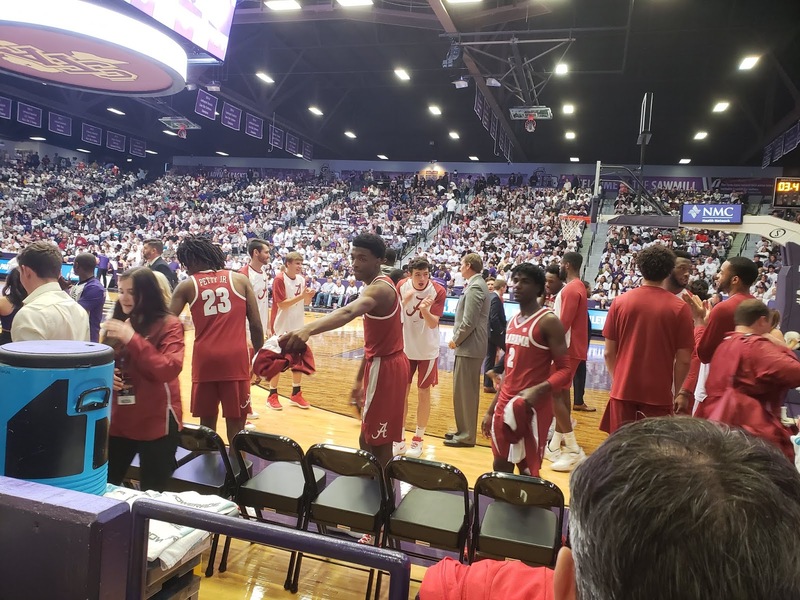 SFA did rip-off a couple of classless red-clad MLB teams that play in the NL Central with a timeout feature called "bandwagon cam," in which they focused on Bama fans in the stands and put captions such as "Has never been to Tuscaloosa," and "Doesn't know what Roll Tide means." I get the Cardinals and Reds doing this to the Cubs, Chicago really DOES have bandwagon fans, and I know we do for football, but...I really don't think anybody is jumping on the bandwagon of our perennial mediocre basketball squad, much less going to bum-(insert word bobbyjack won't let me say here), Texas on a cold rainy day to watch them play against a forestry school. Personally, no offense to SFA, but I don't think we should agree to go to places like this. In a sense they earned this game with their play over the last several years, but they don't appear to be as good this year and this probably will not end up being enough of a high quality road win to justify the expense and inconvenience, not to mention the perception of us agreeing to play somewhere like this. Up next, we return home for the start of SEC play as Big Blue Nation will invade Tuscaloosa to watch the 13th ranked Kentucky Wildcats take on the Tide. Tip-off is set for noon on ESPN, but unfortunately I will be on a flight to California for the football championship game at the time. I booked this long before the basketball schedule was released, but I'm hoping I'll be able to catch most of it on the plane and perhaps one of my cohorts and will pick up my slack with a recap. I hope everyone had a merry Christmas. 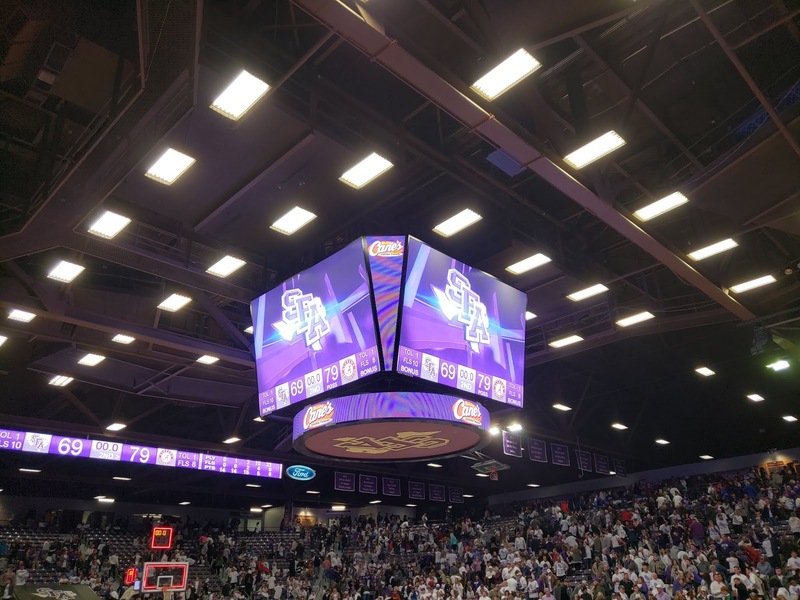 After a break for the holiday, the team will be back at it on Sunday when they travel to scenic Nacogdoches, Texas for a true road game at Stephen F. Austin (KenPom: 173; NET: 197). The Lumberjacks enter the game with a 7-4 record. Gametime is 5:00 P.M. CT. The game will be televised on ESPNU. 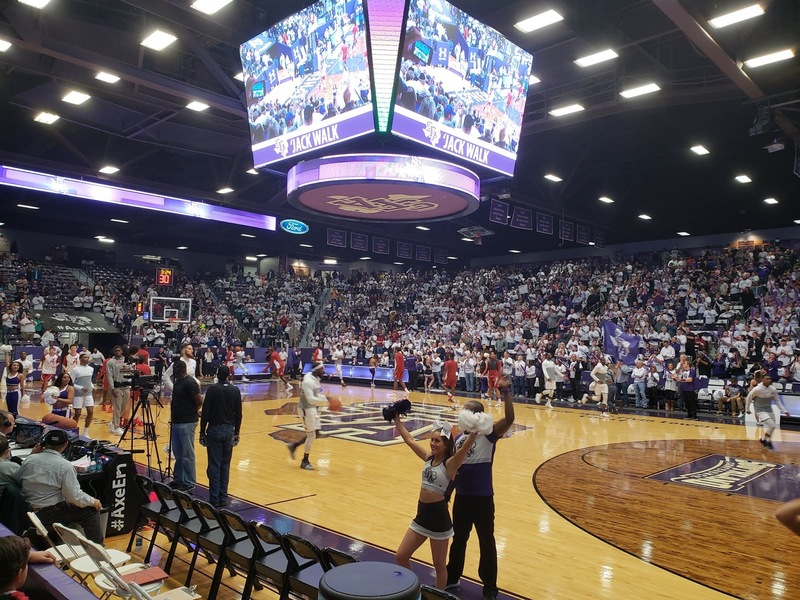 My Two Cents: The Lumberjacks have been one of the better mid-majors in the last six years. In that span, the program has made the NCAA Tournament four times, advancing in two of those trips. This will be the first time an SEC school has traveled to Nacogdoches and the school has been hyping up this game since it was announced. The fact that the name "Alabama" has become rooted in the sports national consciousness as a result of the football success may also raise the excitement level for the locals. Assuming Lumberjack fans turn out, Alabama will be walking into a tough environment. When this game was scheduled, I'm guessing the Alabama coaching staff assumed this would be, at the very least, a quad two opportunity for the team. Unfortunately, SFA's NET ranking entering this game means this is only currently a quad three opportunity. Not exactly a must-win situation for Alabama, but with two current quad three losses already on the resume (Northeastern and Georgia State) and conference play looming, getting out of Nacogdoches with a win would be big. SFA will be bringing some momentum into this game. They've won two straight, including a big win at Baylor on December 18. They're still the favorite at KenPom to win the Southland conference. Bama bounced back from a horrific start to secure a solid victory over the Big 10 foe and improved to 8-3 on the season. Good teams are able to overcome adversity and find different ways to win games. The fact that we won this game fairly convincingly after falling behind by 14 early despite our leading scorer being non-existent most of the game, is actually a really good sign. The Tide came out flat. They appeared unprepared for Penn State's physical style of play. We were being dominated on the boards, we were careless with the basketball, could not get a good look on offense, and allowed the Lions to build a 23-9 lead in the first 8 minutes of the game. CAJ called a timeout, and it appeared that Coach Pettway was really lighting a fire under some guys in the huddle. I'm not sure who said what to whom, but whatever the coaching staff did during that timeout, it worked. Alabama answered with a methodical 24-0 run and took a 6 point lead into the half. We weren't able to put the game away and Penn State slowly chipped away to tie the game at 49 in the second half, but Donta answered with a couple of dunks and we quickly got the lead back up to 7 points where we more or less maintained it for the remainder of the game. The biggest positive from this game, in my opinion, was the play of Donta Hall. It's one thing to dominate a much smaller Liberty team, but to lead the team in scoring with 17 points against arguably the best big man we've faced to date (I would argue the Arizona guy was probably better, but it's at least debatable), and to do so against a physical, defensive-minded team, was great to see. If Donta can play like this consistently, we'll be a difficult out in conference play. Riley's play was a very pleasant surprise. He played solid defense, got some key rebounds, hit a big 3, and I thought his physical play on both ends was a spark to the rest of the team. I've been hard on him at times, but he's been though a ton during his career between injuries and health issues, and he's been resilient. He definitely has a role on this team, and this game was a perfect example of the coaching staff using him in the right way and him fulfilling that role. We all thought Kira would struggle at some point, and against a more physical, mature defense he was held scoreless most of the night. Still, he stepped up in the final minutes and pushed the tempo and made some key baskets and free throws in the final minutes to close out the game. Most importantly, the team showed they can win without the 17 year old carrying the bulk of the load. JP scored 13 points and had 5 rebounds despite only going 1-3 from 3 point range. It's great to see him contributing from the inside and out. T-Mack was also in double figures with 11 points, and he had nice starts to both halves. Herb scored 8 and played great defense as usual. He was 3 of 7 from the field and 2 of 4 from the line, baby steps, but he's moving in the right direction. We were only 13 of 21 from the line as a team, and that's why this game was closer than it needed to be. Penn State has played a difficult schedule and thus is a top 60 RPI team, but I don't think they have the offensive firepower to be a real threat to make the tournament. Still, this was an encouraging win against a good defensive team, and I was pleased with our ability to make adjustments to the way the game was being called. Alex only played five minutes but I'm okay with that as I think this was a bad matchup for him. My only real gripe with the substitution patterns this game is that we had another scoring deficient lineup for a period in the second half, and I thought AJ's 7 minutes was a little too many. Even though Kira was struggling, he still should have played 32 minutes at a minimum. Overall, it was a solid win against a decent major conference team. There was a decent crowd considering there were no students on campus and it was the Friday night of Christmas weekend. I would estimate a little over 5,000 were there, and only a few dozen Penn State fans were scattered throughout. It was arguably the best home atmosphere we've had this year, the crowd was loud at key moments and positive throughout. Up next, we hit the road for our last game before conference play begins by travelling to Nacogdoches, TX to take on the Stephen F. Austin Lumberjacks Sunday at 5 p.m. SFA has established themselves as legitimate mid-major power by making the tournament 4 of the last 5 years and winning a game in two of those years. The game will be broadcast on ESPNU. 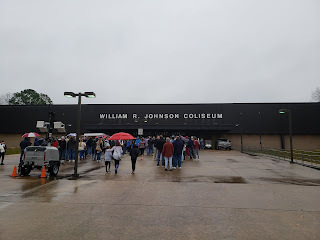 Incidentally, on the off-chance someone is reading this in East Texas and would like to go to the game, I've got an extra ticket, free for a Bama fan, let me know in the comments. 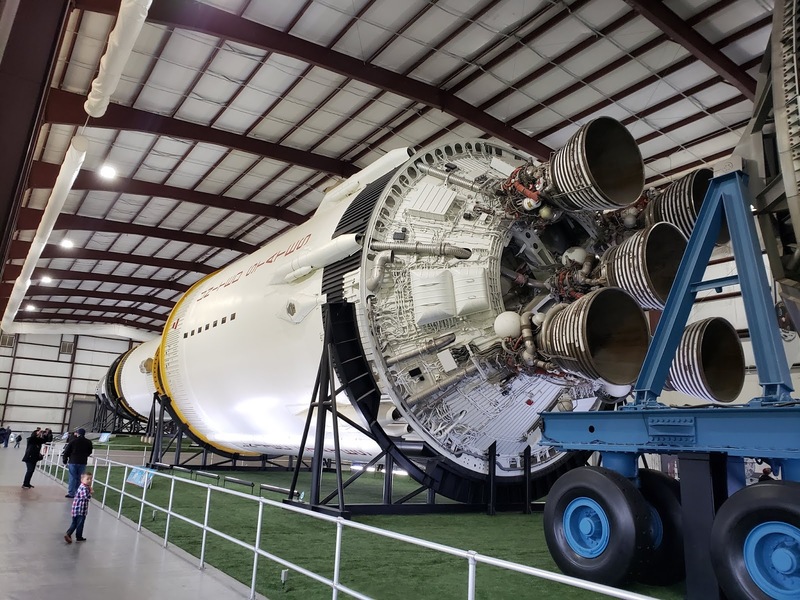 Following a short trip to Huntsville for the Rocket City Classic, Alabama will return to Coleman Coliseum on Friday night for its final game before Christmas. Awaiting them will be the Penn State Nittany Lions (KenPom: 42; NET: 68) from the Big Ten. Penn State enters this game 6-5 (0-2 in conference play). Game time is 8 P.M. CT. The SEC Network will handle the television duties. With a large portion of the students likely absent from this game due to break, I implore those of you in the area to get out to Coleman and support the team in this game. My Two Cents: The first thing that stood out to me when I sat down to try and wrap my head around Penn State is that, despite a 6-5 record, the Nittany Lions are still a top 50 team at KenPom. Penn State has played a very difficult schedule. The Lions have a bad loss to Bradley on a neutral floor, but aside from that the other four losses were an overtime road game at DePaul (just outside KenPom's top 100 at 101), and three losses to teams in KenPom's top 26 (at Maryland, Indiana and a neutral floor loss to N.C. State). Mixed in with that is a home win over Virginia Tech, which is currently top 10 at KenPom. So yeah, Penn State is 6-5, which isn't great obviously, but their schedule and that big win over Virginia Tech suggest they're a much better team than their record would indicate. The Tide improved to 7-3 on the season with an 84-75 victory over the Liberty Flames in the third annual Rocket City Classic in Huntsville. (Side note, can anybody explain to me why the Flames have an Eagle as their mascot and logo?) This was one of the best game plans the coaching staff came up with all year. We took advantage of our size and athleticism advantages by pushing the ball when possible and establishing the post by running the offense through Donta early in the game. Donta responded with a career high 21 points, 4 blocks, and made 9 of 11 from the charity stripe. Unfortunately Liberty was able to stay in the game throughout the first half by making nearly 50% of their 3s. I didn't think our defense was terrible, they had a few wide open looks when they made our bigs chase them around the perimeter, but for the most part we contested them fairly well. We had 8 turnovers in the first half and went to the locker room with only a one point lead. JP set the tone in the second half with two early 3 point baskets to stretch the lead to 7. Other than a stretch around the 13 minute mark when we had an odd ball lineup of Dazon, AJ, Riley, Alex, and Herb that allowed Liberty to cut the lead to 1, we maintained control of the game and had an 8-12 point lead throughout. The Flames made just enough 3s, and took advantage of some poor help-side defense inside to prevent us from putting the game away. Donta had a posterizing dunk over a Liberty defender in the second half. 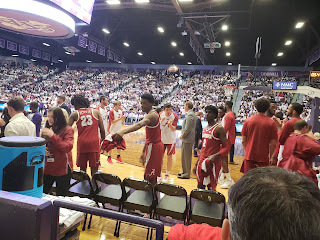 Kira Lewis was instrumental in keeping the uptempo pace to Bama's liking in the second half while valuing the basketball. We only had 3 turnovers in the second half, and Lewis ended up with 17 points in his return to North Alabama. JP scored 16 points including 3 of 7 from three point range in front of his hometown crowd. It was also good to see Herb start to come out of his slump. While he uncharacteristically bit on a few fakes on the defensive end leaving open shooters in the first half, he managed to make 3 of 4 from the field and scored 8 points. Riley played 15 minutes and had 4 rebounds but still generally looks over-matched. With the exception of that stretch in the second half when Liberty cut the lead to one, I thought our substitution patterns were improved. While 15 and 12 minutes for Riley and AJ respectively are too many in my opinion, at least we didn't see the Donta and Galin dual center combination in this game. The crowd was a bit disappointing, I would estimate only about 5,000 of the 6,500 seats were used. 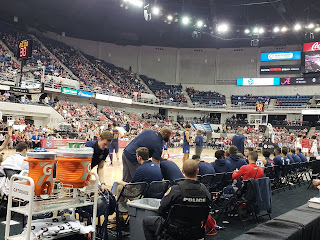 Our seats were on the front row, but at such an angle so when the players on Liberty's bench stood up, it blocked our view of the entire court, as you can see from the pic above. So, I watched most of our offensive possessions in the second half on the video screens. Jim Farmer, Bobby Lee Hurt, and other Huntsville basketball legends and corporate sponsors were honored throughout the game, and they all met with Knight Eady officials in our corner before being recognized on the court. Coach Jack Doss was especially courteous in going out of his way to confirm that he wasn't blocking our view. I wish they would add a screen that shows player points, fouls, etc. I will give them credit for removing the ice that caused so many issues with the floor last year. The atmosphere was generally dead and quiet most of the night. I think the novelty of this event has worn off a bit, and it will not produce the packed crowds unless we're able to schedule a bigger name opponent, or at least a team with more regional interest. I enjoy the games and setting there, but would like to see us rotate playing one neutral site game per year between there, Birmingham, and Mobile. I suppose I could even stomach a once per decade or so trip to Montgomery thrown in there as well. Up next, we return to campus for a matchup against the Penn State Nittany Lions Friday night. Tip off is set for 8pm and it will be televised on the SEC Network. 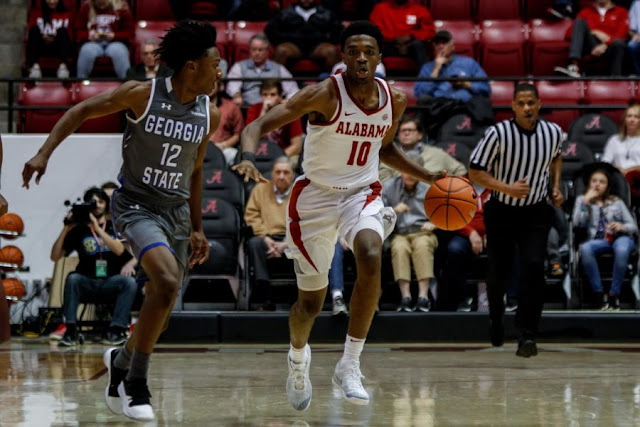 After a nine-day layoff for finals, the Alabama men's basketball team travels to Huntsville on Tuesday for the Rocket City Classic at the Von Braun Center. Alabama will face the Liberty Flames (KenPom: 88; Net Ranking: 36) from the Atlantic Sun Conference. The Flames enter the game with a 9-2 record, which is their best start since 1991. Game time is 7 P.M. CT. The official site does not list a TV option, but I checked the upcoming games on the ESPN app and this game is listed as an SEC Network+ game so for those of you unable to make the game in person you will be able to stream the game. 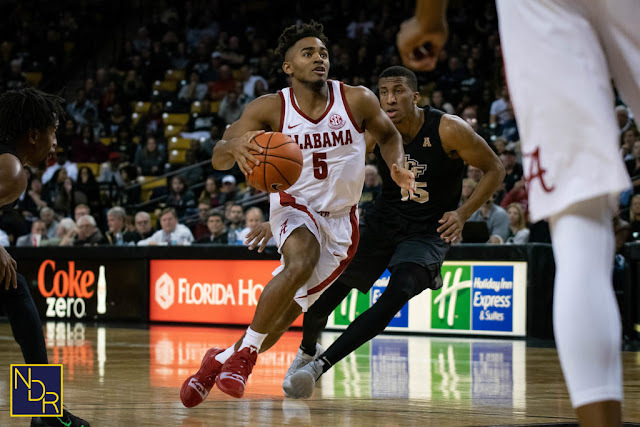 My Two Cents: Tell me if you've heard this before: Alabama is preparing to play a mid-major team expected to contend for its conference title. Liberty is in its first season as a member of the A-Sun, but the Flames are currently projected, along with Lipscomb, to win the league title. They also have a 26-point win over the same Georgia State team that upset Alabama and Georgia. KenPom only projects Alabama as a 3-point favorite in this game. So yeah, the same thing applies here as it did vs Northeastern, Murray State, Georgia State, etc. : If Alabama doesn't show up locked in and ready to play, Liberty is more than capable of beating them. Liberty does quite a few things well based on the advanced stats at KenPom. They are currently rated in the top 100 in both offensive and defensive efficiency. The Flames play at a slow pace (ranked 309 at KenPom in adjusted tempo). What is frightening if you're an Alabama fan is that Liberty plays at a slow pace, but they're really efficient on offense. Their effective field goal percentage is a fantastic 57.4%, which ranks them in the top 10 at KenPom. By comparison, their opponents effective field goal percentage is 48.1% (the national average is 50.5%). Liberty also doesn't turn the ball over much; their turnover percentage is only 16.6% (the national average is 19.1%). They make their opponents defend for long stretches, protect the ball, and score efficiently. They make 39.2% of their 3-point shots and 56.3% of their 2-point shots, which rank them in the top 50 at KenPom in both categories. They also shoot the ball well from the free throw line, making 74.8% as a team. There was big recruiting news on Friday. Trendon Watford, a five-star forward in the class of 2019, narrowed his college choices to four schools. Those four are Alabama, Indiana, LSU and Memphis. Watford is a top 30 national prospect and the top prospect in the state of Alabama. He's been a primary target of the Alabama coaching staff for at least two years. If he commits to Alabama, the 2019 class will certainly be a top ten class for the program with three top 100 players (Juwan Gary, Jaylen Forbes and Jaden Shackelford) already signed. Watford is currently scheduled to make an official visit to Alabama the weekend of the Kentucky game (January 5). I reached out to Jon Manson at A Sea of Red to find out a little bit about the Liberty squad. He kindly provided the response below. If you visit A Sea of Red, please abide by their site rules and be a good representative of our University. This may be the best Liberty basketball team we've ever had. It's still really early and only time will, but Coach Ritchie McKay has this thing rolling. He was our head coach for seasons about a decade ago before leaving to go to Virginia and be Tony Bennett's top assistant for 6 years. He returned in 2015 and brought the pack-line defense with him. You will see a lot of similarities between the Flames and Cavaliers, particularly on the defensive end of the floor. We've just moved from the Big South to the ASUN, this is our first season in our new league. Based on early season results, it should be an exciting two team race between Liberty and Lipscomb. We're currently leading the ASUN in scoring defense, steals, turnovers, FG%, FG% defense, 3pt FG made per game, 3pt FG%, and 3pt FG% defense. We have a very balanced team. Our big man Scottie James nearly averages a double-double. Lovell Cabbil is our senior leader and 1,000 point scorer. Georgie Pacheco-Ortiz is our 3rd year starting point guard and calming influence. Darius McGhee is a 5'9" spark plug off the bench. He's been our best players at times, and at others he's looked like a freshman. The team will be very confident going into this game. We blew out Georgia State just prior to Alabama's buzzer-beating loss to the Panthers. We're hopeful we can pull out the win. It would be a big resume boost for us if we're able to make the NCAA Tournament and could help us stay off the 16-seed line. Alabama built a huge lead, blew it again, but made some big plays down the stretch to improve to 6-3 on the season with a hard fought win over Arizona. This game showed why many of us still believe this team has the potential to be at least as good as last year's version, while also featuring some of the things that has frustrated us all in this early season. Alabama played about as well as possible in the first 15 minutes of the game. Donta got off to a slow start but kept his head in the game and really picked it up, dominating the boards. Alex Reese was a key part in building the lead with his play on both ends. He was arguably better in defending the post than Donta was, and he was scoring from inside and out. T-Mack had one of his better games. In general, we did a great job of getting in transition after securing defensive rebounds, and made 4 of 9 from 3 point range in the first half. Unfortunately, once again we made some bone-headed substitutions late in the first half. This business of playing Donta and Galin at the same time is about to drive me crazy. At one point I even screamed at the coaching staff "This lineup doesn't work! PLEASE put either Tevin or Alex in for Donta or Galin!" CAJ and staff ignored me, other fans gave me dirty looks, and that lineup, which also featured AJ Jr, proceeded to allow the lead the dwindle to 9 going into halftime. We also used the two big combination for a couple of minutes in the second half, and saw the remainder of our small lead disappear when Arizona went up for the first time. I just can't understand why CAJ keeps putting them on the floor together when it hasn't worked all year. To the team's credit, unlike in the Georgia State game, we responded when challenged. We gave up too many easy baskets in the second half, but we played better defense after surrendering the lead, and got some key rebounds late in the game that allowed us to re-establish control of the game. Arizona is a solid team, and you knew they would make a run. I'm disappointed we let them come all the way back, but proud of how our guys responded. Kira Lewis led the way with 20 points including a huge step back 3 with 13 seconds remaining to increase the lead to 5 points. He really should have been in the game at the end of the first half with only one foul. Alex had 15 and as I said above had a great all around game. Tevin and Donta were also in double-figures with 12 and 13 each. Donta had 9 rebounds and Alex had 8. Galin also played well when he was allowed to play the 5 position and not sharing the court with Donta. I really like Galin's game, he scored 8 points, and continues to work hard and give positive contributions off the bench. JP continues to struggle with his shot, but unlike last year he's still helping us when on the court. He played above average defense, had 6 good rebounds and 4 assists. It's only a matter of time before the shots start falling. Herbert is playing hard and still playing great defense, but he's a huge liability on offense right now. He can't score from the field or the free throw line, and while he's always been somewhat limited offensively, it's never been this bad. I think he may have a case of the "yips." It could be that he's over-thinking it, as he knows that's the part of his game that needs to develop to play at the next level. It got to the point where Arizona did not even bother to cover him beyond 5 feet from the basket, essentially giving them an extra roaming defender to double team at will. I would not have had him in the game at the end, but he did get a huge rebound, and wisely passed the ball quickly before he could be fouled, and that led to Kira's dagger 3. Dazon Ingram did not return after halftime due to back spasms. Speaking of halftime, we were treated to Red Panda pictured above. I love her. I've probably seen her perform close to a dozen times and it never gets old. She is arguably the greatest athlete of our generation. I think we should offer her a scholarship and let her kick extra points during the upcoming football playoffs. If she can kick bowls onto her forehead, surely she can accurately kick a football through the uprights. I would bet she's a better free throw shooter than most of our team, too. Considering it was a noon tip-off on a cold, rainy Sunday, I thought the crowd of around 7,000 was pretty solid. The fans were positive and loud throughout, it was certainly the best home atmosphere we've had yet this year. Arizona brought a couple hundred or so fans who were all in the upper rows of the coliseum. They were loud enough that the "U OF A" chants could be heard on the floor during their run. There was also a delay, with around 4 minutes remaining that seemed to kill some of our momentum due to a clock malfunction. I understand yesterday the women's game was delayed because the roof was leaking. We have such a lovely arena; I'm glad the renovations are in phase 2, clearly there is no need to be in any hurry. Up next, we make the trip to north Alabama for the Magic City Classic next Tuesday where we will face the Liberty Flames in Huntsville. Tip off is set for 7pm (or 30 minutes after the UAH game) from the Von Braun Center, and there is no TV as far as I know. Liberty beat Georgia State by 20+ points and played both Georgetown and Vandy close, so we will likely need to play better in this game than we have in recent years to get out with a win. The Alabama men's basketball team will attempt to halt a two-game losing streak on Sunday when the Arizona Wildcats (KenPom: 49) come to Coleman. Arizona (7-2) is arguably a top ten program in the sport over the last thirty years so hosting them in Tuscaloosa is a big deal. The hope is that Coleman will be full and loud on Sunday afternoon to greet them. Game time is 12:00 P.M. The game will be televised on ESPN. My Two Cents: Let's be honest a moment. Those of us who have been following the program over the years have seen our fair share of basketball losses. A team is going to lose games in college basketball, it happens. But there are some kinds of losses that are so deflating that it can make a fanbase, if only temporarily, question the direction of the program under the current leadership. This is typically a direct result of the frustration that arises from the extreme highs and lows that are witnessed in such games. When the game ends on a low note, it's common for people to let the emotion of the result overwhelm them to the point of cursing and pointing fingers and assuming the worst is yet to come. Maybe the worst is yet to come, or perhaps we'll look back a month from now at the Georgia State game and think, "yep, that one hurt, but it wasn't the end of the world for this team in hindsight." I'm all in when it comes to my Alabama basketball fandom, for better or for worse. I will sunshine pump when things are going well, and I will gnash my teeth when things are going poorly. And in rare instances, I will keep a cool head and try to take a sensible look at the state of things. That's my objective as I write this preview, ice pack attached firmly to my head. Alabama hasn't exactly put itself behind the eight ball in terms of its postseason resume, but the margin for error has become very thin. Frankly, one could argue that these next four non-conference games prior to the beginning of conference play are of the must-win variety. Alabama's two best wins so far are Ball State and Wichita State on a neutral court. Both of those are currently quad two wins. The remaining four opponents will likely not rate higher than quad two wins by season's end, but wins in all four would stabilize Alabama's resume for the moment, while also giving this team momentum heading into its first two conference games vs Kentucky and at LSU, which will both be major tests. The short version of all that: Alabama needs a win on Sunday. Ladies and gentlemen, the captain has turned off the seat belt sign. You are now free to move around the cabin. We had a 21 point lead at the half, led by 22 at one point and still had a 15 point advantage with only 9 minutes to play, only to flush it all down the toilet with terrible shooting and lazy defense. In a move that should have been made at least three games ago, Tevin Mack finally started over Galin. T-Mack had one of his better games. He scored 12 points and played adequate defense for the most part. The smaller lineup was able to get off to a fast start and build the aforementioned lead. Once again, with a size advantage at nearly every position on the floor, our offensive game plan was to shoot 3s and try to beat them at their own game. Somewhat surprisingly, it actually worked, at least for a half. We made 8 from downtown in the first half. Unfortunately, that was unsustainable, and poor shooting combined with taking our foot off the gas on defense in the second half led to one of the most epic meltdowns you will see in a college basketball game. It was good to see Riley Norris return from his health issues. He scored 4 points and switched with Alex for offense/defense substitutions in the final minutes. Donta had a double-double with 11 points and 11 rebounds, so that was an improvement over his previous efforts, but his defense of the rim down the stretch left a lot to be desired. Dazon played well with 17 points and 8 rebounds, but uncharacteristically choked at the line down the stretch. Kira continues to be our best player and leading scorer, but he struggled when they started playing more physical in the second half. Herbert is in a terrible slump offensively. He was 0 for 6 from the field and 1 for 6 at the line. As I mentioned above, we did an offense/defense substitution for Alex/Riley at the end of the game, why not do the same with Herb and maybe JP? Herb was every bit the liability on offense that Alex was on defense. He missed two free throws that would have maintained a two possession lead in the final 2 minutes. We had a ten minute scoring drought that allowed the Panthers to chip away at the lead, primarily with Simonds attacking the basket on the dribble drive. The body language from our guys and the defensive effort down the stretch was most disappointing. The lack of leadership on this team was on full display. We need an alpha dog that will get in somebody's grill and challenge others to pick up the intensity when things start going south. We had that last year in young Bull. It's obvious the coaches aren't going to do it, so we need someone to fill that role. Everyone thought the game was over when we were up 20+, and when they got back to within shouting distance, we acted like we were more annoyed to still be in a game rather than motivated to meet a challenge. We have a lot of talent on this team. I wrote earlier this year we have one of the longer and more experienced teams we've had in some time. We need leadership, but I'm not sure anybody has the personality to step up. Ideally it would be your best player, but it's not fair to expect that from a 17 year old who should be playing high school basketball. Give some credit to Georgia State. They never gave up, fought their way back into the game, and took advantage of their opportunities. We double teamed their star and they found the open man who made the game winner at the buzzer. I understand the frustration, but please keep in mind we are only 8 games into the season. As I said above, this team is not as bad as it's looked at times. We will probably pull some upsets and probably lose some more like this when we are favored. We've said repeatedly on here that the 2019 recruiting class will be key to the near term future success of this program. Like it or not, Coach Johnson will not be involuntarily terminated at the end of this season, regardless of the results. The best thing we can do for this program as fans is continue to support this coaching staff and team in a positive way. Not only are the coveted prospects of the 2019 class watching, but should the rumors of CAJ's return to the NBA prove true, so will be potential head coaching replacements. Let's all do our part to make Alabama basketball an attractive place to play and coach. It's easy to be a fan when we're winning NCAA tournament games, but now is the time the guys need us to step up. The crowd may have been the worst of the season. I don't think there was more than 4,000 there, and it wasn't at all noisy until the very end. Georgia State only brought 20 fans or so, and other than the one I knew sitting near me, I really didn't even notice them until the buzzer when they were rightfully excited and cheering. 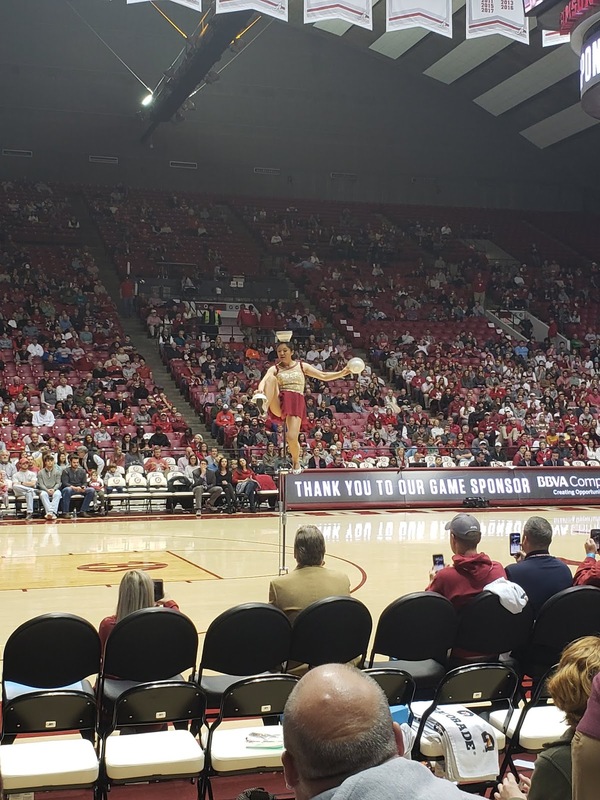 My Tuscaloosa connections tell me that the marketing of the program seems to have dropped off from recent years. There's been no stories of CAJ going to speak at fraternity or sorority houses, fewer if any radio and billboard ads, etc. This, combined with the assistant coaches seemingly taking on a more prominent role in the actual coaching on the bench during games, makes me wonder if perhaps he is eyeing one of the two already open NBA positions. Up next, the Arizona Wildcats will be visiting from the wild west for a high noon tip-off Sunday. This isn't the same Arizona team featuring two lottery picks that we dealt with in Tucson last year, but even a relatively down Arizona squad will be a formidable foe. The show down will be broadcast nationally on ESPN, but please, if it's humanly possible for you to get to Coleman, please do so.